Golf carts aren’t just for the golf course, anymore. The same manufacturers who make basic golf carts also offer specialized electric vehicles for personal use. And gasoline-powered golf carts, while disappearing on most courses, are still valued for use on the farm or in the wilderness. 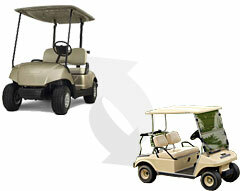 Golf carts can be outfitted with a range of features – including tops, windshields, and multiple seating options. You can easily add thousands to the sticker price of your golf cart by loading it up with extras. This is particularly true if you want to make your vehicle street legal, which requires turn and brake signals, seatbelts, and more. Consider your needs before purchasing a golf cart. Make sure it has the features you’re looking for, but doesn’t exceed what you can afford. Visit multiple dealerships to in person and ask to see their service and parts departments in action to get a feel for how they do business. If possible, work with factory-authorized golf car dealers. They have easy access to OEM parts and can provide quality factory training for their repair technicians. If you are planning on using a cart as a personal electric vehicle, look for suppliers with experience in creating street-legal carts. Regulations vary from state to state and even from one locality to another, so the dealer's experience and understanding can be important in making sure your vehicle has all the right safety features. Gas or electric golf carts? Gas golf carts are preferred in farming and hunting, as they can carry heavier loads than electric golf carts and are the better choice for sustained use. You can also easily carry an extra can of gasoline to extend the operating range. Electric golf carts are far more popular for actual golf course use, since they're much quieter and less polluting. What will you be using your golf/utility vehicle for? Are you interested in a new or used vehicle? Are you interested in an electric or gas vehicle? Will you be purchasing or leasing your vehicle? What additional accessories will you need?